While all the broadcast networks continue to sue Aereo, the streaming service seems determined to expand. Today, it announced that Atlanta will be the third metro area (following New York City and Boston) to receive service. The company says it will launch Aereo, which streams broadcast TV live online for a monthly subscription fee, in the metro-Atlanta area starting on June 17 for invited users who pre-registered. The rest of the region won’t need to wait too long, with Aereo opening it up to all users on June 24. 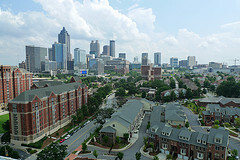 And it won’t just be people in the heart of Atlanta who will have access; it will be everyone in the Atlanta DMA (designated market area), which includes more than 5 million people in three states — Georgia, Alabama and North Carolina. The company says it will make 27 over-the-air broadcast channels available to customers in the Atlanta DMA, including WSB-HD (ABC), WAGA-TV (FOX), WXIA-TV (NBC), WGCL-TV (CBS), WPBA (PBS), France24, BounceTV, MyTV, AntennaTV, Univision, MundoFox, and UniMas. Aereo is set to launch in Boston starting tomorrow. The broadcast networks contend that Aereo is effectively stealing their signals and retransmitting without paying for it. Aereo maintains that its setup — which dedicates a tiny antenna for each customer — is doing nothing more than transmitting over-the-air signals from that antenna directly to the customer; no different than putting an antenna on the roof, claims the company. Executives at CBS and News Corp (FOX’s parent company) have talked about plans to ditch over-the-air signals if Aereo is victorious in court. Even if this is just in the cities where Aereo is launched, you’re now talking about pulling these signals from around 20 million consumers. Previous Is It Okay To Change A Baby’s Diaper In Public If There’s No Restroom Changing Table?